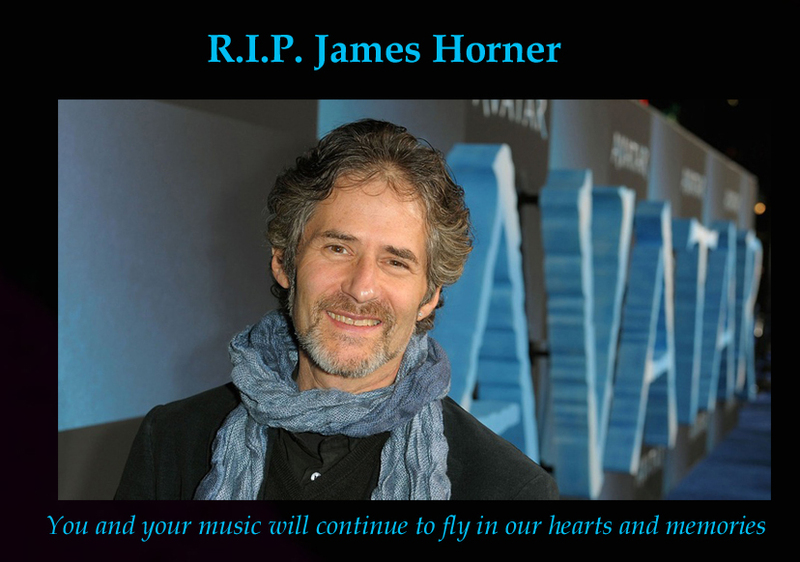 Film music fans were grieved to learn of the death of James Horner. A passionate enthusiast of flying, Horner was killed when his private plane crashed sometime after 9:30 AM in a remote area north of Santa Barbara, California. He was 61. Composer of than 150 film scores, Horner began at New World Pictures, scoring a fistful of low-budget sci-fi and horror films for Roger Corman. HUMANOIDS OF THE DEEP (1980) was given an effectually brooding score; although reflective of Jerry Goldsmith, young Horner’s leading influence, HUMANOIDS holds many evidences of techniques Horner would later develop with more freedom, such as the echoing string chords that accompany the prowling sequences. His lavish symphonic score to BATTLE BEYOND THE STARS (1980) and his electronically-tinged, atmospheric music for WOLFEN brought him some due attention, and with his ensuing score for 1982’s STAR TREK II: THE WRATH OF KHAN, Horner broke into the A-list. A catalog of masterful and much-loved scores – many in the sci-fi and horror genre in the ‘80s and early ‘90s, followed through the end of the decade – KRULL, BRAINSTORM, and a return to the cosmos with STAR TREK III: THE SEARCH FOR SPOCK. During the 1990s Horner’s musical focus largely moved away from science fiction and its ilk into more mainstream big-budget cinema – but not entirely. The various fantasy sequences derived from classic literature in 1994’s THE PAGEMASTER gave Horner the opportunity to provide a wide assortment of musical treatments, from classic swashbuckler to soaring fantasy and menacing horror, while the similarly family-friendly fantasy JUMANJI (1995), wherein he constructs a vivid and mostly episodic score, providing unique musical set pieces designed for specific standalone sequences – the rampaging rhinos, the energetic elephants, the adventurous apes, and so on – with a primary through-theme being the heroic adventure motif for the Robin Williams character. Beginning with 1985’s COCOON, Horner began an ongoing collaboration with director Ron Howard. His score for this sentimental story about a group of elderly retirees who encounter visiting aliens who give them a second chance at life, captured some impressively rousing and passionate music that takes on an emotional depth that can be as adventurous as it is poignantly moving. The blood-freezing discordance of ALIENS, which reunited Horner with one of the art directors from BATTLE BEYOND THE STARS – James Cameron, now an accomplished director – launched an association that would be very auspicious in the coming years. Horner linked his score stylistically with the Goldsmith original while concentrating on underscoring the film’s visual action, using electronics to emphasize the alien “Xenomorphs,” and a military figure for percussion and PATTON-like echoplexed trumpets to represent the military team of US Marines sent in to eradicate a horde of aliens. Rejoining Ron Howard for the Tolkeinesque adventure fantasy WILLOW (1988), Horner providing an enchantingly-flavored score comprising orchestra and choir that bolstered this entertaining fable about a dwarf charged with protecting a baby princess from a wicked queen. Horner gave the Disneyesque adventure fantasy HONEY, I SHRUNK THE KIDS (1989) a somewhat cartoonlike score, from the short Roger Rabbit cartoon TUMMY TROUBLE, which preceded the feature (Horner also scored it) to the compatible sensibility of rampant action and busy, “antic” cartoon writing that is portrayed throughout the rest of the feature as well. The 1990’s saw Horner expanding into more mainstream thrillers and dramas, but he also contributed some stellar scores for the decade’s sci-fi and fantasy efforts. His score for Joe Johnston’s THE ROCKETEER (1991) carried a gentle sense of Americana as it supported the story of a steel-clad super hero battling Nazis on America’s home front during World War II. The music for CASPER (1995), a feature film adaptation of the children’s cartoon series created in the 1930s, was a tour-de-force of mischievousness. The score bristles with activity, coloring both the ghost’s activities and the wonderment of his very existence. Horner closed out the decade on top of the world – with two Oscars, one for best score and the second, shared with lyricist Will Jennings, for best song – for Cameron’’s TITANIC (1997). His first post-TITANIC score, 1998’s asteroid-vs. Earth disaster movie DEEP IMPACT, is at once stone-cold sober, bitterly reflective of the grave extinction-level-event that is at the heart of the story, and vibrantly warm with human passions, focusing more often on the human impact than that of the onrushing comet. Like TESTAMENT and much of TITANIC, Horner’s music acknowledges the epic, terrible disaster occurring while bolstering with intimacy and sweeping melodies the perspective of the human characters caught up in that tribulation. Horner also lent a strong degree of sympathy to MIGHTY JOE YOUNG (1998), Disney’s colorful remake of the 1949 picture. The score is earthy, with lots of African styled percussion and chorus behind its noble trumpet theme, which is also expressed in measures both poignant and profound by strings and choir. The poignant melodies Horner composed for Chris Columbus’s BICENTENNIAL MAN (1999) spoke layers of emotional depth for the heart of the cyborg man seeking to find himself – and his soul – in an uber-technological future. Horner’s ability to capture the inner spirit and mirror the emotional underpinnings of developing characters and situations serves him very well with this score. Through the 2000’s into more recent years, Horner scored a variety of pictures, while becoming a little more selective on what or for whom he would work. His genre-notable works from the new millennium’s first decade include Ron Howard’s live-action remake of Dr. Seuss’ HOW THE GRINCH STOLE CHRISTMAS (2000; aka THE GRINCH in UK), providing an effervescent fantasy score that brought the town of Whoville to a festive, emotive life. Horner also collaborated with lyricists Will Jennings and Cynthia Weil on several of the songs featured in the movie. His music for THE FORGOTTEN (2004), a science fiction thriller about a grieving woman who begins to suspect her son, believed killed in a plane crash, may in fact be alive and part of an extraterrestrial experiment. Horner’s score begins with a tone of grim melancholy in recognition of the woman’s perceived loss, which will grow into a surging, discordant pattern, percussively distorted as the truth becomes known, finally resolving at the end of the film with a bright disposition of reconciled joy. For THE SPIDERWICK CHRONICLES (2008), Horner crafted a bright score that is brimming with enchanting melodies and vivid orchestration, and for his reunion with Cameron on AVATAR (2008) he created a score of varied breadth that enlivened the various cultural nuances of the planet Pandora, providing tribal vocalisms, ethnic flutes, and beaten frame drums to evoke the native spirit of the aboriginal Na’Vi, while a soaring theme for orchestra and chorus unites the spirit of hero Sully with that of the Na’Vi and, especially, love interest Neytiri, serving to stretch the heart strings at the story’s significant moments and its climax. With a simple yet sturdy motif for the greedy military-industrial machine that serves as the heroes’ primary threat, both motifs interact with aggression and vigor during the great battle that climaxes the film, given further power by thunderous drums, trilling brasses, and chanting choirs that build the battle into a cataclysmic epic of cultures. And with his last genre film score, for Marc Webb’s reboot of THE AMAZING SPIDER-MAN (2012), Horner spun a splendid super-hero score that is saturated with lyrical sensitivity and melodic grace, capturing the varying perspective nuances of Peter Parker as he struggles to deal with his newfound “spider sensibilities.” Foremost above these subordinate motifs is Horner’s engaging main theme – the confident, heroic Peter Parker. Horner uses these motifs separately and together to intensify character interaction and underscore the intimacy of the story being lived out beneath the awesome conflicts that erupt across the cityscape. All the attributes of Horner’s film scoring style are present in this score, the traditional, melodic-based orchestral approach, the sweeping anthem for the hero, and the impassioned poignancy of the insecure teenager struggling beneath the costume. The sudden loss of James Horner this morning is a huge and a personal loss for film music, and music in general. His legacy of music is considerable and his efforts within the fantasy, science fiction, and horror genres have been potent and notable. More than one generation of film composers and aficionados have been touched by his music for nearly 40 years, as evidenced by the very palpable grief and dismay over his death that’s been shared on social media. May his music continue to soar.